If your not sure what size of Packaged Pumping Station is needed just give us a call. This Single JTFSSurface Water 190L Pumping Station is a pre-assembled, ready to use package pumping station suitable for the handling of clean, grey or effluent water. Guide Rail Packaged Sewage Pumping Station in 2 inch Rigged Macerator pump station suitable for all applications, domestic and commercial for foul, sewage pumping. Single dwelings up to 5 people. Guide Rail Packaged Sewage Pumping Station in 2 inch Rigged Macerator pump station suitable for all applications, domestic and commercial for foul, sewage pumping. Single dwelings up to 10 people. We do a wide range of pumping stations for lots of different applications, if you don’t have gravity flow, you will need a pumping station, which we can supply you. Just give us a call or send the drawings and we will quote you. When it comes to finding sewage pumping stations, you needn’t look any further than JT Pumps. Here at JT Pumps, we have generated experience from supplying customers with what they need most. No matter what your pumping requirements are, we have a perfect solution, waiting for you! There are several ways in which you can benefit from our sewage pumping stations, take our packaged sewage pumping stations for instance. But what are Packaged Sewage Pumping Stations? The domestic sewage pumps at JT Pumps are used to remove sewage where there is know gravity to the main sewer. We supply these in a wide range of sizes and styles that are easily adapted to suit specific requirements. How do the sewage pumping stations work? 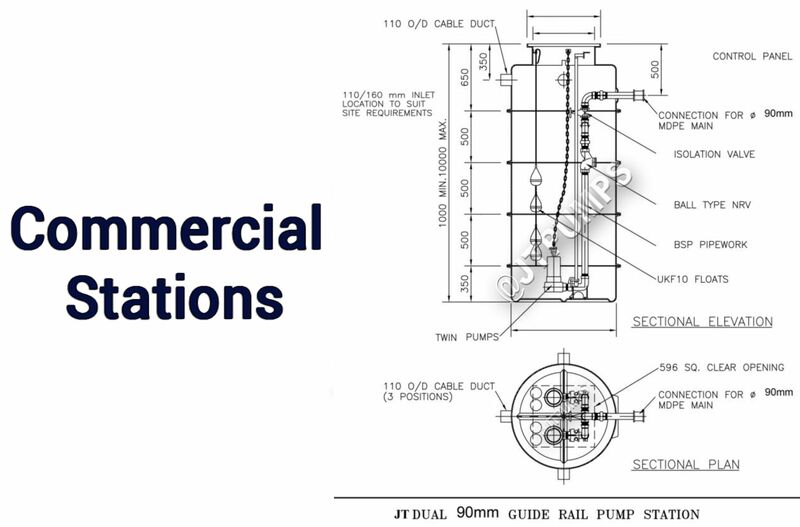 JT Pumps supply only high-quality pumping stations, made to last and to look visually appealing. The process for our domestic sewage pumps is relatively straightforward; the water that’s removed from the pump stations will be pumped underground to the main sewer making it highly efficient. The sewage pumping stations are an ideal solution for the removal of sewage water. They are fully automatic making things a whole lot easier. Which Domestic Sewage Pumps do we have? Here at JT Pumps, we have a variety of sewage pumping stations available, including the Micro Sewage Pumping Stations. These are in stock in a wide range of capacities, starting from 190L up to 2000L. If you’re on a limited budget and looking for a domestic sewage pump, you’ll want to take a look at our Mini Micro Sewage Pumping Station. This particular product is always ready to perform to a high standard when there is no gravity. This tank is job-ready meaning it’s appropriate for use in the garden, extensions and other small applications. In terms of quality, the Sewage Pumping Station 2 inch JTDual Rigged station is one of the best! the pumps are cast iron with stainless steel which means it’s especially reliable and a sturdy solution. The GRP tank has a high water alarm and can have up to 4400L capacity, making it an appropriate option for up use by 30 people. If you need any assistance choosing the right domestic sewage pump, then get in touch with our team of professionals. We are always on hand and think nothing less than to help you to find exactly what you need, suiting your requirements with regards to affordability and application. Call us on 0844 414 5800 to find out more! How are the Domestic Sewage Pumps used? Our sewage pumping stations are suitable for several applications. Schools, hospitals and housing developments that need to remove sewage safely. JTPumps’ packaged sewage pumping stations offer exceptional value for money, they are tailored to customer needs with regards to application and also budget, so make sure you find something suitable from our range of sewage pumping stations! How do you know if you need a Packaged Pumping Station? If you don't have gravity flow to the main sewer you will need a pumping station. If you have an outbuilding or an extension, you could benefit from one of the domestic sewage pumps from JT Pumps, they’re reliable and provide excellent value for money. Are you looking for a complete wastewater management plan? If so, you need one of our packaged pumping stations, with our Wiring and commissioning service and also our service plan Consider our domestic sewage pump station to be your go-to equipment for improving reliability and efficiency.